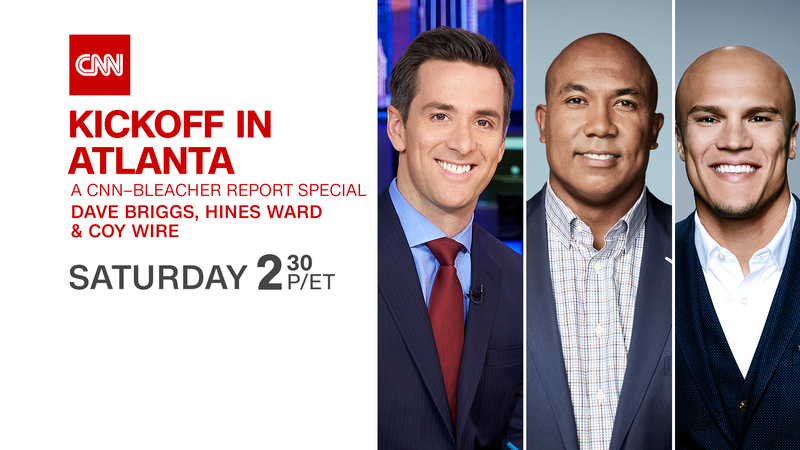 Leading up to Super Bowl LIII, CNN will present a half-hour special hosted by CNN anchor Dave Briggs along with two-time Super Bowl champion and HLN Sports Contributor Hines Ward, NFL veteran and CNN Commentator Coy Wire and CNN Commentator Andy Scholes. Kickoff in Atlanta: A CNN-Bleacher Report Special will showcase the unique position the network holds by calling the host city home – reporting from multiple locations throughout Atlanta, including the CNN Center that overlooks Mercedes-Benz Stadium. The story this year is youth vs. experience – the Los Angeles Rams, helmed by youthful head coach Sean McVay and quarterback Jared Goff, take on their first Super Bowl against the experienced New England Patriots, led by head coach Bill Belichick and quarterback Tom Brady, who have made it to the big game nine of the last 18 seasons. During the 30-minute special, Kansas City Chiefs quarterback Patrick Mahomes breaks down his experience playing against Brady, and Houston Texans defensive end J.J. Watt shows viewers what the Rams need for a win. Three-time Super Bowl champion Troy Aikman adds color from a player’s perspective, discussing the nerves and focus that go into the game, while Atlanta Falcons kicker Matt Bryant schools CNN’s Ward and Wire on how to kick a field goal – is snap, laces out and kick really that hard?